WTI crude prices saw a sharp downward correction yesterday. 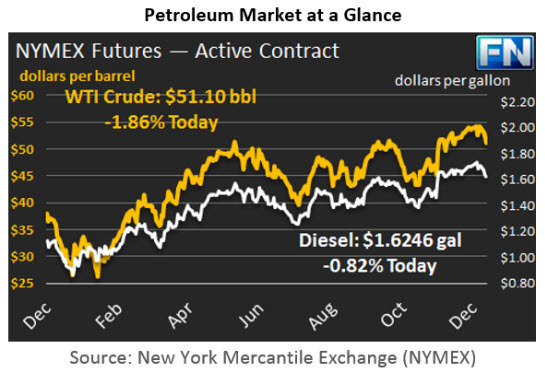 As noted in yesterday’s FUELSNews, prices had a difficult time clinging to $52/b. But in a surprising move, prices have continued down, crashing even below $51/b. WTI opened at $50.81/b today, $1.02/b below yesterday’s opening price, and the lowest opening price since December 1st. 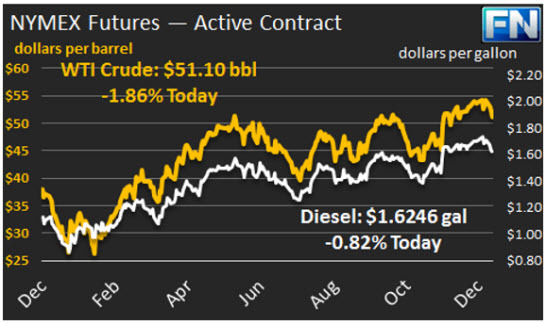 Prices have crept back up slightly and are $51.10/b currently, $0.28 above yesterday’s close. Product prices followed a similar trend: dropping sharply, then levelling off in early trading today. The price slump was traced in part to speculative buying at the market’s opening on January 3rd, which propelled prices to eighteen-month highs. Concerns about oversupply brought on a spate of selling. Despite the price weakness, some price recovery appeared after information was leaked concerning the cuts Saudi Aramco is making on crude sales to Asia for February. Reportedly, sales to China, Malaysia, and India are being cut. Distillate opened at $1.6106/gallon in today’s session. This was a drop of 2.73 cents from yesterday’s opening price. Current prices are $1.6246/gallon, 1.32 cents above yesterday’s close. RBOB opened at $1.5574/gallon today, down 1.24 cents from yesterday’s opening. RBOB prices have weakened for the past four sessions. Yesterday’s closing price was $1.5467/gallon. RBOB prices are currently $1.5786/gallon, 1.99 cents above yesterday’s close. The EIA released its data on U.S. Retail Gasoline and Diesel Prices for the week ended January 9th. Prices for both fuels rose by 1.1 cents per gallon. Details are presented in our second article today.